Canoeing & Canoe Hire at Black Mountains Activity Centre CanoeingHire a Canoe! A great way to spend a few hours exploring the river Wye. You can hire a canoe for half day, full day or for multi days. Our hire time:- morning 9.30 afternoon 1.30 full day 9.30. 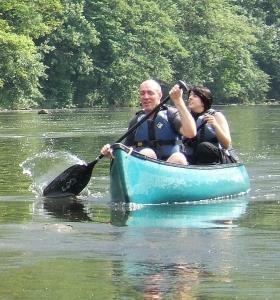 We also offer Canoe taster days! where you can lean to paddle a open canoe! Canoe Hire on the River Wye. Directions from the M4: Exit at Juction 24, travel North on the A449 to Raglan, Take the A40 West to Abergavenny, continue through Crickhowell 2 miles passed the village, turn right after the Cider Mill Pub onto the A479 to Talgarth. Once in Talgarth turn left in the square sign posted for Brecon then take the first main turning for Hay on Wye on the A4078. Black Mountain Activities is opposite the next junction in the direction of Hereford.